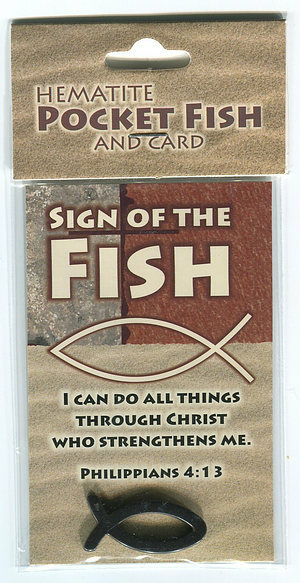 A simple yet stylish and solid, dark metallic hematite Christian fish symbol. Make an unashamed witness with combined fish symbol and striking card with sign of the fish on the front and the words of John 3:16 on the front and the word of Philippians 4;13 (I can do all things through Christ)on the on the reverse. Ideal as a gift, prize or encouragement another Christian. Each pocket fish is made from beautifully smooth hematite - the natural mineral form of iron oxide, giving it an impressive feeling of weight for its size. Each fish comes in a clear cellophane envelope with a hanging tag and card with a strong image, card declaring the truth of scripture. Hematite Pocket Fish by Swanson was published by Swanson in April 2012 and is our 737th best seller. The ISBN for Hematite Pocket Fish is 0788200870394. Be the first to review Hematite Pocket Fish! Got a question? No problem! Just click here to ask us about Hematite Pocket Fish.